We're pleased to offer the popular HSH Home Buyer's Calculator Suite, a fully functional -- and extremely useful -- financial tool from our friends at Wheatworks Software. It's entirely free, and compatible with Windows 95/98, ME, NT, 2000, and XP. Download the HBCS. 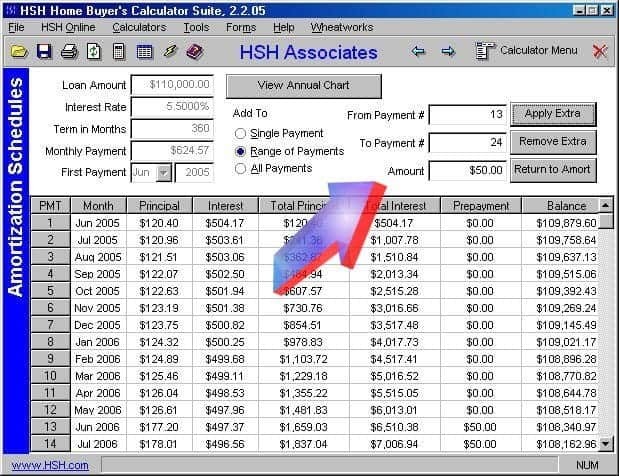 We'd love to list suggestions on how to get the most use from the HSH Home Buyer's Calculator Suite, the very popular financial tool from Wheatworks Software. If you'd like to offer a tip for power users, please send it in. Use the Amortization Schedules calculator. Enter your loan values, and click "Create or Refresh Schedule" to create the initial amortization schedule. Be sure to view the monthly schedule; it shows the remaining balance. Now, click the "Add Prepayments" button; some new input boxes appear. "Range of Payments" should already be selected. Enter the appropriate info in the "From Payment", the "To Payment", and "Amount" boxes and click the "Apply Extra" button. In our example, the "From Payment" would be 13, the "To Payment" is 24, and the "Amount" is $50. To see the effects of prepaying your mortgage every month, you would of course use the Prepayment Calculator. But what if you want to make irregular prepayments -- that is, make a prepayments now and then? Use the Amortization Schedules calculator instead. Enter your loan values, and click "Create or Refresh Schedule" to create the initial amortization schedule. Now, click the "Add Prepayments" button. To enter one prepayment per year, enter "1" in both the "From Payment" box and the "To Payment" box; then, click "Apply Extra." Repeat the process, but enter "13" in both of those boxes; that takes care of a single prepayment in year 2. Note, in the above image, that you can see the prepayments included in both the 1st and 13th payments. Now start over with a new amortization schedule. Your loan will now have a remaining term of 29 years. Enter the new rate and the balance, and repeat the process. This will not give you to-the-penny accuracy, but it will be fairly close. Under "Calculator Menu", select "Amortization Schedules", then fill in the basic info for your loan (number of years, interest rate, starting date). Then click the "Create or Refresh Schedules", button and the window should fill with the basic amortization for your loan. Once that's done, click the "Add Prepayments" button, which will give you some prepayment options. Add in your prepayment information. Select "Range of Payments", then add in the number of the payment when you began sending the extra principle (payment 1, for example) and the end of the range for this amount of principal prepayment (prepayment for payments numbered 1 through 12, for example). Add in the dollar amount in the "Amount" window, then click the "Apply Extra" button. Now do the same thing over again, this time for the next period (i.e. payments 13-24) with a new extra payment amount, and so forth for all the periods in which you wish to make prepayments. You'll see the numbers in the window change as you do this... use the little "scroller" in the right of the amortization window pane to scroll down as you go to see the changes... and all the way to the bottom to see the total interest costs and reduction in term (if any). Have a suggestion for power users? Feel free to send it in!